So what is the verdict on the SCA T15 ?? Inquiring minds want to know !! I have not tried these and am not affiliated but here are a couple of places for tube guitar amp kits. Every studio needs at least one tube guitar amp, right? If I find others I will add. "There is never enough time to be in a hurry"
fiddler59 wrote: So what is the verdict on the SCA T15 ?? Inquiring minds want to know !! Very short answer: great transient response. Quiet. Still good head room compared to many other options. Even not knowing the price its a good pair to have (you want two as they're good on lots of stereo applications). The favorite use at Treelady was distorted electric guitars paired with any ribbon mic or SM 57. I wouldn't have guessed that but that's why we do the tests. An 8-pack of these would be such a SICK live rig that you would need to go to an 8-channel Millennia or Grace to exceed its performance in that regard. Ach! It appears the DIY500 has been discontinued. Though, the Classic API kits would provide a similar framework for experimenting with opamps and transformers. I like to build the stuff that I record with. Seventh Circle Audio - New B16 Compressor Kit! 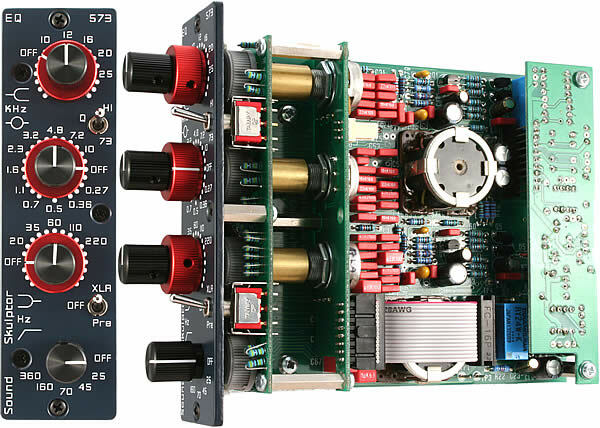 Sound Skulptor ships the EQ573, an equalizer based on the design and components that were originally used in the Neve 1073 and 1084 modules, that has been adapted to the Lunchbox '500' format. The EQ573 can be used as a standalone unit but also as an insert, between the input and output stages of the Sound Skulptor MP573 mic pre, recreating the full architecture of the 1073. This product is a new addition to our range of DIY kits. The DIY approach on these products makes them affordable to most - without compromising on quality. The skills needed to build the kit are basic, thanks to careful design and to the very detailed instructions. Of course, the products are also available fully assembled for the non-technicians. Last edited by JPK on Mon Apr 13, 2015 7:30 am, edited 1 time in total. The A12b is a simple, single stage preamp module that evokes classic American designs of the early '70s. Using exactly the same circuit as our modular SC25 op-amp, the A12b offers all of the performance of our standard A12 at a lower price and without the complication of assembling a kit. The A12b sounds fantastic with rock drums and electric guitars, but is versatile enough to be used in virtually any application. * High Gain of up to 70dB, including the voltage step-up provided by the transformers. * Tremendous Headroom of over +30dB into 600 ohm loads. * Stepped Gain Control from a 12 position Grayhill switch provides accurate and repeatable gain settings in 5dB steps from 15dB to 70dB. * Gain Trim by a high quality Bourns panel control enables up to 6dB of cut at any gain setting allowing fine adjustment between steps. * Slow-Rise Buffered Phantom Power Switching minimizes pops and thumps. * Neutrik XLR Connectors provide a professional interface and and eliminate point to point wiring. * CineMag Transformers are the highest quality, made in the USA. * 20dB Pad on board, post output transformer, jumper switched. Order with our 2RU chassis, 80W power supply, and internal wiring harness for a package price of $599! Also check out the new low prices on standard A12 kits and assembled modules! Yep. The T15s. They were the right preamp in this situation. Now, we had been using it on guitar, and this drummer was not beating the snot out of his cymbals. It was more of a classic rock thing, but the T15 + the vintage Neumann's were the bomb. Last edited by ghaines on Tue Jun 19, 2012 2:52 pm, edited 1 time in total. Working on the new Austin Blumlein Ribbom michttp://www.diyribbonmic.com/ and a Tube or FET mic from Equinox EQU47 http://equinoxsystems.net/store/equ47/ Hope to have more for you all soon. The Austin Ribbon Mic is really really really nice. The top end is extended and smooth. Look for a review. The LINE2AMP reamping box has been the most popular kit on DIY Recording Equipment since it's introduction in 2011. The kit has been continually refined since then to improve the quality and ease of construction. I've heard from many customers who have successfully built it in under an hour. The box is based around a USA-wound Edcor transformer. Sonically, it's practically transparent and indistinguishable from $100+ reampers. Finally, it's cheap! $39.95 for the full kit. The MP 5.12 is a microphone preamplifier based on one discrete Op-Amp, one Cinemag input transformer and one Cinemag output transformer. It delivers what was called the "LA sound", popularised by the famous American consoles of the 70's : the punchy midrange and tight bass tone of the iron. The MP 5.12 is great on drums, electric instruments and generally all close miked sources. This product is a new addition to the Sound Skulptor range of DIY kits. The DIY approach on these products makes them affordable to most - without compromising on quality. The skills needed to build the kit are basic, thanks to careful design and to the very detailed instructions. Of course, the products are also available fully assembled for the non-technicians. Last edited by JPK on Mon Apr 13, 2015 7:29 am, edited 1 time in total. After many requests, we're happy to introduce the rugged, compact, convenient, and affordable OneShot chassis. Designed primarily for easy tabletop operation, the OneShot can also be rack mounted. Just remove the feet and screw up to four OneShot chassis directly to a Raxxess UNS-1 as shown. No other hardware required!
? DI output drives preamp input transformer for maximum ?color? Prices start at $149 for a separate kit and go down from there when combined with preamp modules. Look for pricing to be up on the site by April 1, no fooling.